On Wednesday 27th February 2019, see Paul Shillcock, Emma Hooper and Andy Boutle present at BIM Show Live. This session will focus on the latest International Standard, the ISO 19650, but from a UK perspective. BIM Show live bring three prominent UK BIM crew members to the stage at the 2019 event. 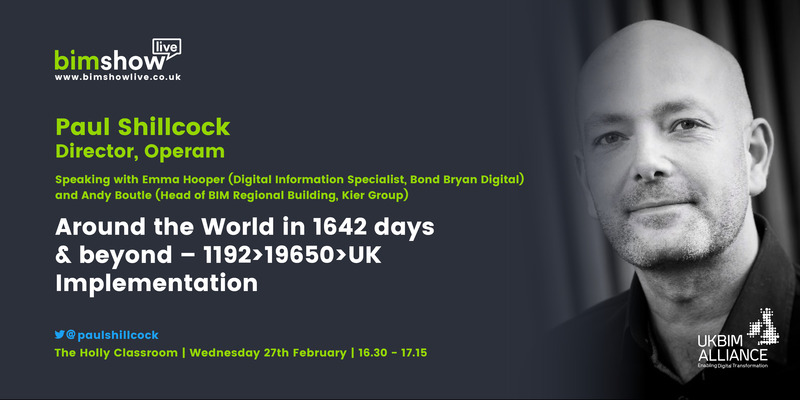 Paul Shillcock, one of the co-authors of ISO 19650, will share the story behind ISO 19650, providing an overview. Emma Hooper will then take us through the implementation of ISO 19650 from a UK perspective, highlighting the differences and talking through the UK Annex and Transitional Guidance Document. Andy Boutle will provide an overview of BSI B555/8 and the work they are doing on the UK Guidance Framework. You will also hear how this group will communicate with you to draw feedback from the industry and how you can get involved. Go here to learn more about Operam. To learn more about UK BIM Alliance go here.